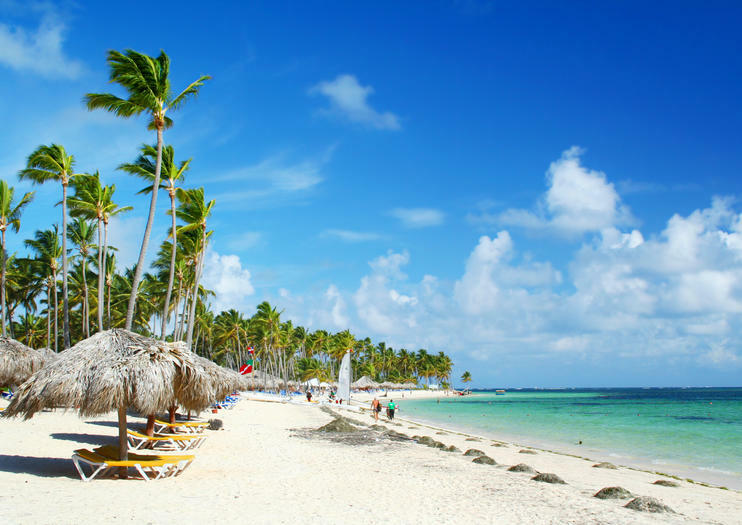 Punta Cana beaches in the Dominican Republic are ideal picture of a waterfront paradise with their pristine white sand, turquoise waters, and countless palm trees. Here are our picks for the best Punta Cana beaches and what you can do while you’re there. As one of the largest and most popular beaches in the area, the town of Bavaro is lined with small shops and dotted with luxurious all-inclusive resorts. Most boat trips and snorkeling excursions to places like Saona Island (Isla Saona) leave from Bavaro Beach. The public beach of Macao feels relatively untouched. It's a great spot to enjoy water sports, including surfing, windsurfing, and parasailing. Don’t miss the chance to get muddy on a Macao buggy adventure. Located far from the tourist activity of the main beaches, Uvero Alto is quieter than most and often reached by boat trip or off-roading adventure. Its name translates to “white beach,” so it's no surprise that Playa Blanca has some of the most beautiful white sands in the country. The waters are calm here, and this stretch of sand can be accessed by dune buggy. Surrounded by tropical forest with palm trees and wildlife close at hand, Cabeza de Toro Beach is a great spot for snorkeling and getting in touch with nature. Located at the eastern tip of the coast, Cap Cana is famous for golfing and for its popular beaches where the Atlantic Ocean meets the Caribbean Sea. This full-day dune buggy adventure highlights the best of Punta Cana. You’ll navigate through rice fields, forests, along scenic roads and near Playa La Vacama in your 4-passenger manual transmission vehicle. Enjoy refreshments plus lunch at a local restaurant, then head to the lagoon where you will take a boat cruise through mangroves to a beach. With a maximum of12 people per tour, you’re sure to get personalized attention from your friendly and professional guide. Learn to surf from a professional during this adventure on the Dominican Republic's Macao Beach. This 3.5-hour activity is suitable for both experienced surfers who want some pointers and complete beginners, who will use a foam surfboard for added safety. Enjoy the personalized attention of your expert instructor, who only works with 2 students at a time. Snacks, bottled water and round-trip transportation from local hotels are included. Drive a Macao Buggy over the Dominican Republic's back roads on this 4-hour tour from Punta Cana. Pass palm trees and tobacco plantations with views of the Oriental Mountain Range. Stop at a ranch for an introduction to local produce like cocoa, coffee, tobacco and Mamajuana (a Dominican aphrodisiac elixir) and green tea leaves. Continue to a subterranean cavern with a sunken swimming hole for a dip, then end the day at Macao Beach, enjoying the sun and sand. Explore the backcountry trails of Punta Cana on the back of a 4x4 vehicle during this guided 4.5-hour tour. Stop at a typical Dominican home, deep in the countryside to sample some of the area's local produce, coffee, cocoa and tobacco. Take a dip in the refreshing waters of an underground cave, then stop at Macao Beach for some fun in the sun and sand. Round-trip transportation from select hotels is included. Experience the natural beauty of one of Punta Cana’s largest coral reefs during this Marinarium Shark and Ray experience. Navigate the underwater world and get an up close look at tropical marine life before making your way to a natural pool and relaxing with a strong cocktail in hand. This family-friendly excursion is perfect for every traveler looking to enjoy the best of Dominican Republic.